Going on an epic surf trip doesn’t mean you have to ditch the whole family. As two parents that surf, we recognize the dilemma that most married surfers with kids go through when choosing their precious few weeks of vacation each year. Your significant other and kids will be stoked when they get to take a break from the daily grind and you get a chance to score waves. So after a year of traveling around the world with our two small children, we’ve found these five surf destinations to be at the top of our list for keeping the whole family entertained while still finding waves. We haven’t been everywhere but of the 30 or so countries in which we’ve surfed, these are the ones that scored highest for us. It doesn’t get much better than J-Bay. Super Tubes is what most people know about (and for good reason). However, there are several other take-off zones in the bay to accommodate less advanced surfers, too. The people are friendly, the town is safe, the food is good, the beaches are eye-poppingly gorgeous, and all this while you’re surfing Jeffrey’s Bay. When you’re surfed out or need to keep the rest of the family entertained, there is the Addo Elephant Safari Park nearby for an incredible self-drive safari and Tsitsikamma National Park for a little hiking. Sri Lanka has a lot of waves. While none would be considered world class, they’re still really good waves in really warm water. Surf shops are everywhere in Arugam Bay and Midigama, which are bonafide surf towns. So you’ll be able to get set up with boards and gear easily if you don’t want to haul it from home. The family will love going swimming with sea turtles in Hikkaduwa or on a safari in Uduwalewe Elephant Park. Sri Lanka is incredibly inexpensive and very kid friendly. Fiji has some of the best childcare options we’ve seen on any surf trip. The kids will be so entertained by the incredibly loving babysitters that you won’t feel bad taking a boat trip and surfing your brains out at Cloudbreak, Restaurants, Wilkes, or Frigates. Fiji is so beautiful that the whole family will love being at the beaches and playing in the water. The Fijians love children. When we returned from our boat trips, we saw them holding our young kids in the kitchen, feeding them and giving them kisses. Costa Rica has waves everywhere. Every time we go there, we find good childcare options. We were able to stay right on Playa Negra and it only cost us $6/hour for child care while we surfed Playa Negra all day. There is so much wildlife to see and plenty of familiar food to eat for the kids when you’re finished surfing. First off, there are waves in India. The water is warm and the waves are uncrowded. There are a couple of surf shops to rent from and the selection is pretty limited but there are quality boards to get your hands on. Head to the Kerala region during Temple Festival season and you will love spending the evenings experiencing the cultural celebrations that occur during temple festivals. The Kerala backwaters are also worth a visit after a morning of surf. The beaches are beautiful and there is a very relaxing vibe for the kids to run around and play. 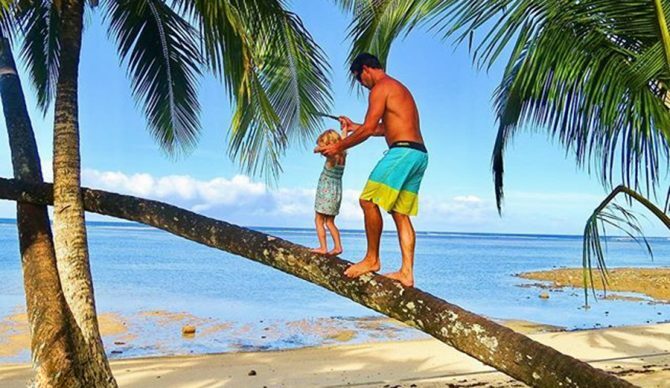 The Cook Islands are a family-friendly place with great childcare options and surfable waves almost every day. The beaches are secluded and there are a ton of really cool things all over the island to do with the kids. Jamaica has among the best childcare options we have seen on our travels, and they have fun waves, too. The only downside is that the best waves are a couple hours drive from most of the accommodation options. If you go on a good day, it will be well worth the drive and the hassle! Follow the Denning family’s adventures on Instagram.